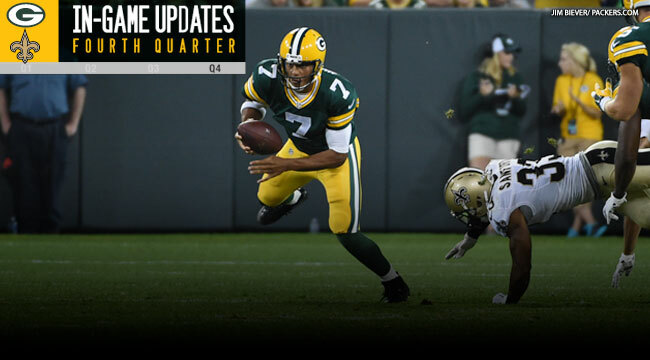 GREEN BAY — Rookie quarterback Brett Hundley made a statement for the future by throwing for 236 yards and four touchdowns in a 38-10 win over the visiting New Orleans Saints. Hundley, a fifth-round draft pick from UCLA, finished the preseason with consecutive impressive performances. So did wide receiver Myles White, who caught two of Hundley’s four touchdown passes. The Saints held a 10-0 lead after a quarter of play. Green Bay finished the preseason 2-2 and will play at Chicago in the season-opener a week from this Sunday.